To meet the evolving needs of travellers, a government program is expanding to help modernize information services for tourists. 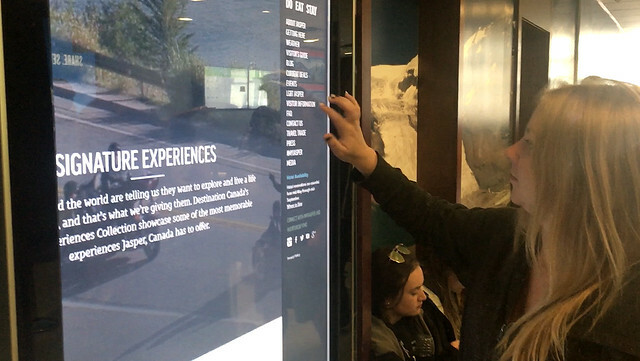 Tourism Jasper used the Visitor Services Innovation Fund to install a touchscreen kiosk and enhance the delivery of travel information at the Glacier Discovery Centre. The Visitor Services Innovation Fund enables visitor services providers to deliver trip-planning information in more innovative ways, such as mobile services, ambassador programs and social media, to engage more travellers. The program has expanded eligibility to include municipalities. Eligible visitor services providers and communities are encouraged to apply for funding before the Jan. 17, 2019 deadline. The fund offers up to $7,000 to organizations that provide visitor services, and up to $16,000 to those that use partnerships to develop new ways to connect with more tourists. Bragg Creek and Area Chamber of Commerce: Implemented a mobile tourism ambassador program that connects with visitors at key destinations within the community. The mobile tourism ambassador helped more than 870 visitors. Crowsnest Pass Chamber of Commerce: Implemented the Adventure Advisor Program to deliver mobile visitor services at different community events and destinations to promote local experiences for visitors. The Adventure Advisor engaged with more than 1,000 visitors within two months. Sundre and District Chamber of Commerce: Delivered a familiarization tour for frontline staff and volunteers, and established a mobile visitor information kiosk that is shared among partners in the region. The project is a partnership between Sundre, Mountain View County, Didsbury, Carstairs and Cremona. Tourism helps diversify Alberta’s economy, create jobs and encourage investment in communities across the province. In 2016, nearly 34 million visits were made to Alberta and tourism spending totalled $8.5 billion (Statistics Canada).